The King's Last Song , by Geoff Ryman, Harper, 2007, 488pp. I left Air, which I liked so much, on P's bedside pile. She did not read it, but she did get me The King's Last Song, Ryman's latest story, which is about Cambodia. It mixes a present-day tale about war-scarred locals and privileged Westerners with the story of King Jayavarman VII, whose golden diary is found and lost in the fictional present. Ryman is a strong and vivid writer, and I read the book through at a rapid clip. 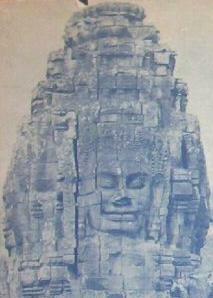 Cambodia is such an interesting place: old travelogues describe at as extra peaceful, with an ancient culture. Then all the Khmer Rouge killing started, and I never really understood why. The book gives a little insight, but is of course rather grim in the modern part. And the old part, while lively, did not draw me in as much as I would have liked. Beyond Jayavarman and his two wives, there were no other historical figures of any depth, and the events flowed too simply. I think the book is for my friends with a particular Cambodian interest. You know who you are.